Kenya’s hopes of defending their overall title at the World Cross Country Championship ended in futility on Saturday after finishing second at the championship held in a tough and demanding course in Aarhus Denmark. Kenya won only two gold medals through Beatrice Chepkoech and the imperious Hellen Obiri. However, Failure to defend the senior men’s and the mixed relays title saw Kenya lose the bid to retain the overall crown. Defending champion Geoffrey Kamworor’s hopes of a third title in a row was thwarted by the Ugandan duo of Joshua Cheptegei and Jacob Kiplimo with Cheptegei becoming the first ever Ugandan to win the senior title. In the mixed relays, Kenya finished second while the junior men failed to return a single medal home. 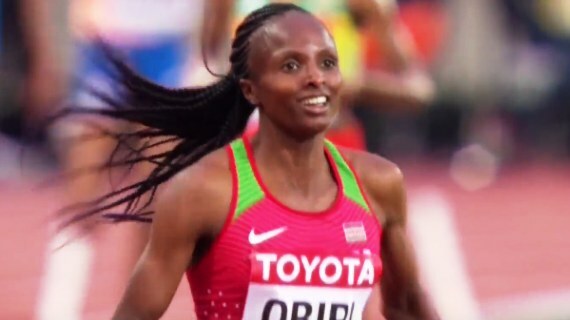 Obiri, the World and Commonwealth champion over 5,000m went in for her debut at the World Cross and she was in line to be the first ever woman to win a title across three major surfaces having won an outdoor and indoor track title already. Obiri stuck to the lead from gun to tape and managed to tackle the challenging hill climb in the course to outdo Ethiopia’s Dera Dida. She stopped the clock in 36:14 with Dida coming second in 36:16. Letesenbet Gidey was third in 36:24 while Chepkoech drifted all the way down to seventh 37:12. Eva Cherono and Deborah Samum followed in eighth and ninth respectively. “The Ethiopians were strong in the hills, it was so tough for me. I only wanted to do one cross country and get a medal. I don’t think I will go on to do another cross country; this is enough for me,” Obiri, said after the race. Kenyans on social media made fun of Cheptegei in 2017 when he was sucked up out of energy to let off a 12-second lead with Kamworor picking the title. Cheptegei had burnt his energy reserves early and a lactic acid retention saw him wobble away. However, he ensured revenge was served cold on Saturday, commanding the race from the start to see him clinch his first ever world cross gold. Kamworor had stuck to the leading pack of four that had Cheptegei and Kiplimo for company with the Ugandans showing patience and waiting for the right time to attack. With less than a kilometer to go, it was clear Kamworor was not defending his title. “The course was very tough especially the hill. But I am happy I got a bronze because I worked hard and this is what I got,” Kamworor stated. Beatrice Chepkoech looked to have won the race at the tape with the Ethiopian duo of Tsigie Gebresalama and Alemitu Tariku surging from the side but the initial officials had given Tariku the win. However, the Kenyans appealed with replays showing Chepkoech had won. After review, she was handed the victory with a photo finish, all having clocked 20:50. She won by microseconds. The first race of the afternoon was the mixed relay with the Kenyan team of Winfred Mbithe, Jerinter Mwasya, Conseslus Kipruto and George Manangoi tasked to defend the title Kenya won in Kampala. However, they could not muster a good tact to deal with the hilly section, something that the Ethiopians did very well. Conseslus Kipruto started, Mwasya followed, all failing to hold on strength on the hill. Manangoi tried to keep pace with the Ethiopians when it was his turn on the third loop, but Mbithe who was expected to anchor the team to victory was completely obliterated to finish third behind Ethiopia and Morocco.